And if Friday's performance was of any indication, Charles O. McBride of Apex (NC) High School is on a momentum tear in the high jump. The high school senior, who's headed to Campbell University in the fall, cleared 7-feet for the second time this season and for the second consecutive week, winning the event at the Bojangles Track and Field Classic in Columbia, South Carolina, to break a meet record that stood for 39 years. While Cardinal Gibbons (FL) junior Jackson Marseille has jumped higher, going 7-1.5 on February 23, no one in the country has met McBride's consistency. 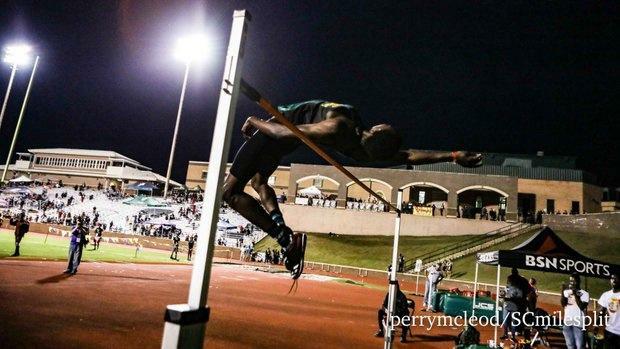 He's the only athlete in the country to have cleared that height more than once. Check out McBride's performance above.